This is a Green Label Grooming and Cleaning Tool for Dyson Vacuum Cleaners. It compares to OEM # 921001-01 (921000-01) and fits the following model: DC41 Animal. PLEASE NOTE GROOMING TOOL DOES NOT FIT: DC01 (Standard, Blue, Absolute, De Stijl), DC03, DC04, DC05, DC07, DC08, DC14, DC17, DC18, DC21 Motorhead, DC22 Motorhead, DC23 Motorhead, DC23 Motorhead Animal, DC33C, DC35; all Dyson handheld vacuum cleaners (DC16, DC30, DC31, DC34, DC43H, DC56), all Dyson cordless vacuum cleaners (V6, V7, V8, V10). 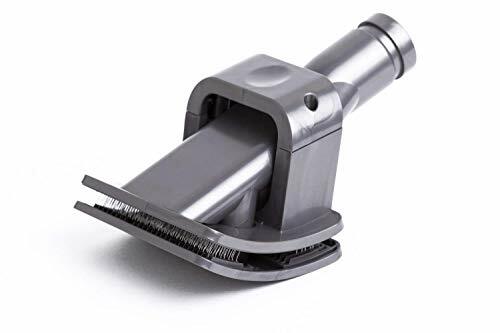 Groom tool for Dyson vacuum cleaners removes hair directly from your dog - before it's shed around the home. Collected hair is then sucked straight into the vacuum. The Groom tool is easy to control. You can adjust bristle length and switch between groom, self-clean and self-store modes with just one thumb. All vacuum brand and model names are registered trademarks of vacuum manufacturers. This product is designed and manufactured by Green Label. This is not a Dyson OEM product and is not covered under any Dyson manufacturer's warranty. The Dyson brand names and logos are the registered trademarks of their respective owners. Any use of the Dyson brand name or model designation for this product is made solely for purposes of demonstrating compatibility. No questions asked return policy. Fully refundable. Green Label is a premium and environmentally friendly manufacturer of aftermarket vacuum and steam mop filters and accessories.